Book a safari lodge and visit the salt water lake Eyasi and see a large diversity of wild animals and birds. Lake Eyasi is a salt water Lake on an altitude of approximately 1000 metres, the lake is located at south west of the Serengeti. The lake borders to crater highlands in the north and tropical rain forests in the south, therefore it is a strongly varying landscape, the result of this is that you can see a large diversity of wild animals and birds. In Lake Eyasi you can find the following animals; giraffes, zebras, leopards, hippopotamuses, several types of monkeys and tropical birds, under which flamingos and pelicans sneer. Otherwise than the lake, the park is also famous for its inhabitants, the Hadzabe which are already here for more than 10000 years. They speak by means of clicking sounds, another tribe that lives in the Lake Eyasi area is the San, they originally come from South Africa. 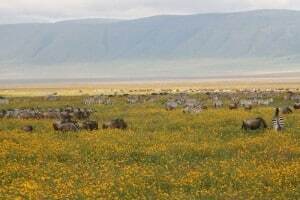 Furthermore there are Maasai and several Bantu tribes that live here. These people still live in a traditional manner, they still hunt for their flesh, they milk their cows, and they find some different kinds of fruit from the trees surrounding the area. My opinion is that this is one of the parks were you still can see how traditional tribes live, also because this park is not visited by many tourists.